Our Mercedes Unimog with 10 inch Jenson Front Chipper is available to hire. It also has a front 2.3m flail, chapter 8 signage and beacons ready for highways. Supplied with a qualified and fully insured operator. The Unimog was developed over 50 years ago as an agricultural support vehicle and it remains a stalwart partner for all off-road applications, including farming and forestry. The key benefit is that the Unimog is a type-approved commercial vehicle for both on and off road operations: and that means it is legally licensed to haul produce, machines and equipment on roads as well as off road. The Unimog’s legendary off-road capabilities, along with central tyre inflation for extra traction and reduced ground damage, allow the driver/operator to leave the road and cross all types of terrain – with no need for specialist off-road traction units or transferring loads, resulting in, increased productivity and efficiency. 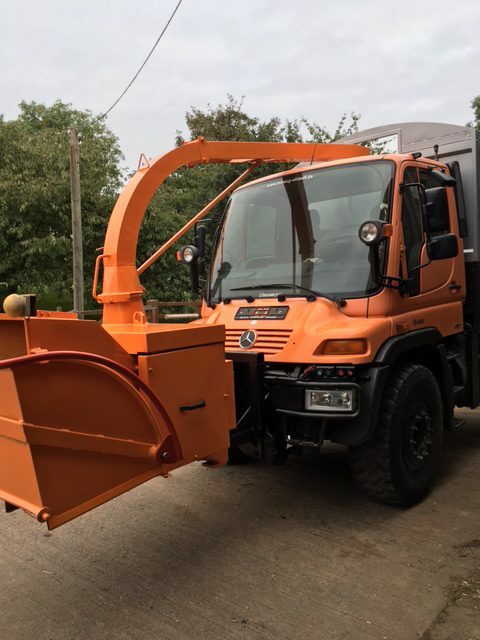 With powerful PTO’s, plus the payload and power to carry a wide range of attachments, the Unimog will drive chippers, spraying and spreading equipment, mowers, hedge cutters – the list is almost endless. If you think we could assist with your project please email info@gclm.co.uk or call 01509270166 and we’d be happy to arrange a meeting to discuss your needs.